Scott is an American company with a lot of experience in producing high quality motocross goggles. 45 years of experience has led to countless innovations and new techniques which are used in all modern goggles. The Scott motocross goggles provide maximum field of view, which in combination with advanced lens technology helps every rider perform. There is a goggle available for every rider, from hobby to advanced, due to the large range of models. Below you will find the 3 most popular Scott Goggles. In the mid-price category, the Scott Hustle is available. The Hustle is a real competitive motocross goggle which is available with both clear and mirror lenses. Due to the 3-layer facial foam and anti-fog treatment, these motocross goggles offer excellent and unobstructed visibility. The most advanced Scott motocross goggle is the Scott Prospect. This goggle is used by many professional riders such as: Pauls Jonass, Austin Forkner, Arnoud Tonus and Justin Barcia. Scott has incorporated a few unique elements in the design of the Prospect to maximize the field of view of the rider, such as a low nose profile, slim frame design and large curvature. Another great feature of the Scott Prospect is the lens lock system. This system makes changing your lens easy and provides a very strong attachment for maximum impact resistance. The outriggers provide comfort and excellent fit in most of the modern helmets by working as an hinge point. The Scott Prospect is one of the best motocross goggles on the market and costs less than €100! 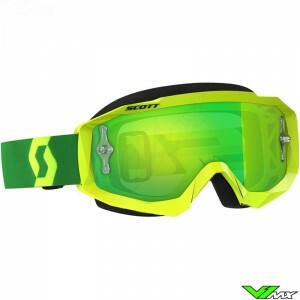 The Scott Split is an OTG motocross goggles, which stands for ‘over the glasses’. It is built with many of the same features as the Hustle, but with more room to wear glasses under the goggle. Improved air flow reduces steaming up on your prescription eyewear. The Scott Split is available in a wide range of editions. The most popular one is the standard version with clear lens. For riders who are facing a ride in the mud the WFS Roll-off version is perfect. A recent addition to the Split line-up is the light sensitive version, which offers one versatile goggle that works in all light conditions. To complete the range of Scott Motocross Goggles an affordable kids version is created. It is called the Scott Buzz and offers great features for smaller faces and helmets. The Scott Buzz is available in 3 editions: with chrome mirror lens, clear lens or with a roll-off system. Check out all kids goggles in the kids motocross gear section of the webshop. 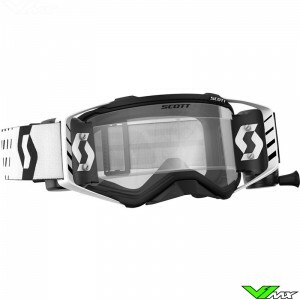 Scott was the first company to make dedicated goggles for motocross riders. 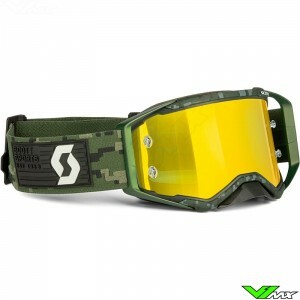 It also has created many innovative features for motocross goggles over the years. Due to years of experience and great team in development, Scott has become a leader in quality optical equipment for offroad riders. One of the recent innovations is an extra-large 50mm roll-off system for the Scott Prospect. It’s the first roll-off on the market that has such a large field of vision. The motto of the vision experts at Scott is “everything starts with good visibility”. Especially in sport like motocross it is important to be able to react quickly to a situation. All Scott motocross goggles have the ability to replace the lenses, this way damage to the lens can easily be fixed. For many of the goggles with mirror lenses an extra clear lens is provided in the box, free of charge. The lenses of Scott motocross goggles contain 3 main technical features to protect your eyes and enhance vision. The first and most important aspect of manufacturing is advanced production techniques with high quality materials. 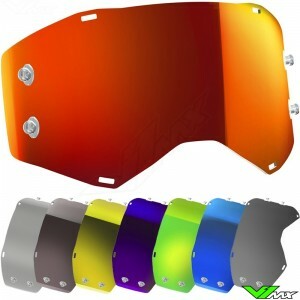 This ensures distortion free lenses that can withstand the though condition of off-road motorsports. The second is UV protection. All Scott lenses are optically engineered to screen out 100% of harmful UVA and UVB rays. The last technology is impact resistance. In order to ensure that riders are safe from impacts of pebbles and flying stones all Scott lenses meet and exceed impact resistance requirements for motocross goggles. V1mx has many different Scott lenses available for different situations. The most widely used lens is the clear lens. This is mostly used in cloudy weather or when riding under trees. In addition, mirror lenses are available. Mirror lenses block some sunlight and filter colors so you can see more on the track. Motocross goggles with mirror lenses also give the rider a unique look. To complete the range, Scott also has enduro lenses available for most models. The enduro lenses have a dual layer which improves insulation and reduces the chance of fogging up. The Scott light sensitive lens is a versatile barrier that adapts to the weather condition. Perfect for half cloudy days and enduro riders. It features photo-chromic technology and adapts automatically to the sunlight intensity. The lens reacts to light changes within seconds. For example, when exiting the woods direct sunlight will hit the goggle. After just a few seconds the lens will start to get darker. The light sensitive lenses are available for most Scott Motocross goggles. Accessories are a must when it comes to motocross goggles. Below you will find more information about the accessories for Scott motocross goggles. Scott makes very good roll-off systems for their motocross goggles. The roll-off systems can be bought as an extra kit. You also have the option to order goggles with pre-installed roll-off. Roll-off systems are perfect alternative to tear-offs, which are banned by some motocross tracks. All Scott motocross goggles with works lenses can be equipped with tear-offs. Works lenses have mounting point build onto the lens. Tear-offs are available in two versions. The most popular one is the standard version with 10 or 20 packs of separate tear-offs. The more advanced versions are laminated. These tear-offs are glued together to prevent dirt and sand from getting in between the tear-offs. Goggles bags are designed to store and protect multiple Scott motocross goggles. The Goggle bags also feature elastic pockets which can be used to store goggle accessories, such as extra lenses and tear-offs. In the bags section of the webshop you will find a large range of bags to store all your motocross gear. We have everything available, ranging from simple backpacks and goggle bags to large travel bags which fit your whole gear kit. Do you have any questions about Scott motocross goggles? Feel free to contact us. We will be happy to assist you choosing the right motocross gear.